Oh! This is a FUN project! It’s easy. It isn’t too messy, and it is quick. 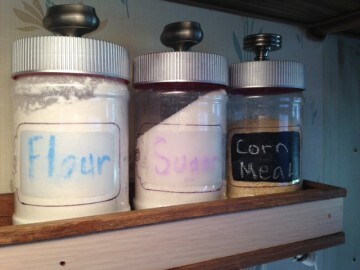 Simply remove any labels or stickers from your containers. Non-dairy creamer container labels are primarily shrink-wrap plastics. They tear off pretty easily once you get a small split started. 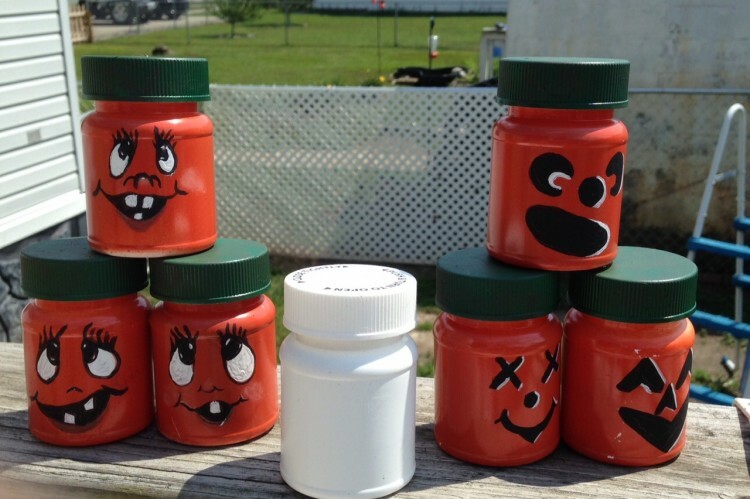 Pill bottles may take a little more work. Spray the lids black. If you want the females to have different colors knock yourself out. 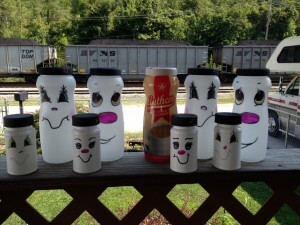 Use some glitter glue and acrylic paints to decorate the hats, or hot glue some accessories on. 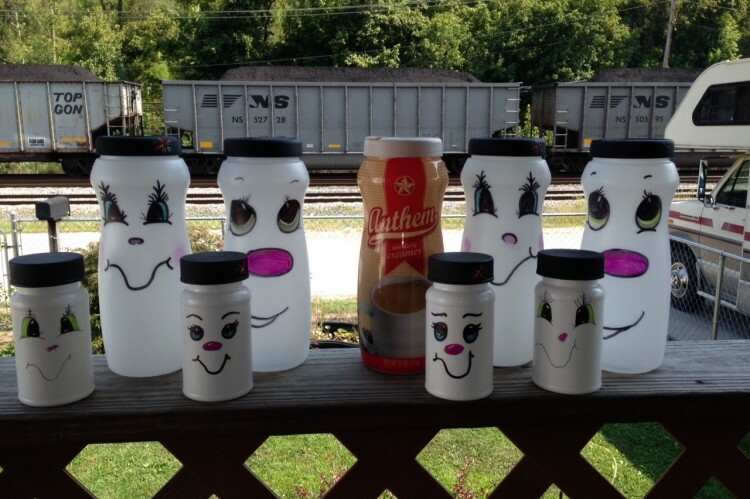 Since my containers are all white, I don’t need to spray them with white paint. If your containers are not white, test your spray paint to see if it will adhere to your plastics. If not, get some plastic primer at the box store. Use a variety of permanent markers to draw and color in facial features. I did use a dab of acrylic paints for some highlights and special touches. 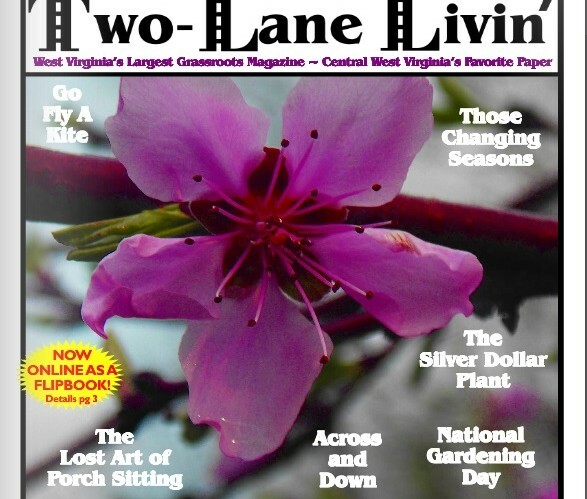 Robin’s Upcycle is located in Kanawha County, WV. Open by appointment. Plastic pill bottles. With the Baby Boomers aging, plastic pill bottles are everywhere and end up in landfills by the thousands every month. 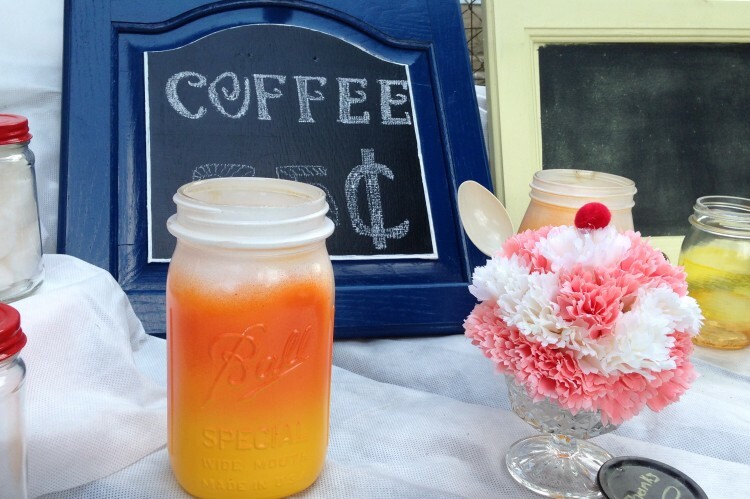 Here is a little upcycle project you may want to do with the kids. As with most of my upcycle projects, thoroughly wash the bottles, and remove the labels. Dry completely inside and out. Most slick plastics need primer before painting. This can be purchased in the painting section of most box stores, and particularly home improvement stores. It is a clear spray that makes the plastic receptive to paint. Use according to directions, paying attention to drying times. 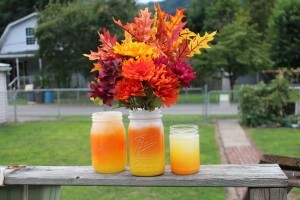 To get an even finish, use spray paints as the base colors for the bottles and lids. Be sure to let each coat dry completely before moving on. 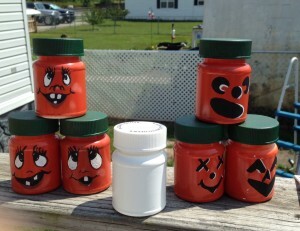 A black, permanent marker may be used to outline your holiday design, in this case a selection of Jack-O-Lantern faces. White acrylic paint was used to create the eyes and teeth, and to add a few highlights. Allow to dry and finish off with sealant. Add your choice of special touches, ribbons, stems, leaves, etc. 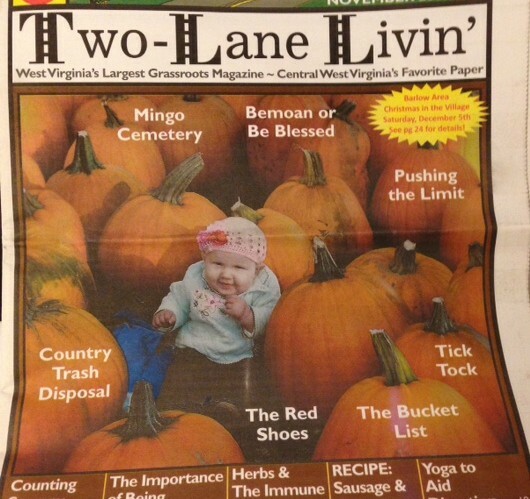 This is my column from the August 2015 issue of Two-Lane Livin’ WV’s Largest Grassroots Magazine! The heat of summer is upon us. After a long hot day, finding a comfy spot in the shade is a great evening treat. It is even better if you made the seat yourself. 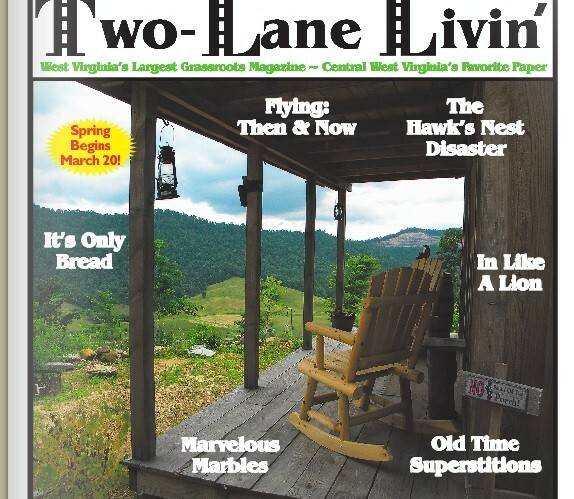 Benches made from old head and foot boards are in fashion right now. 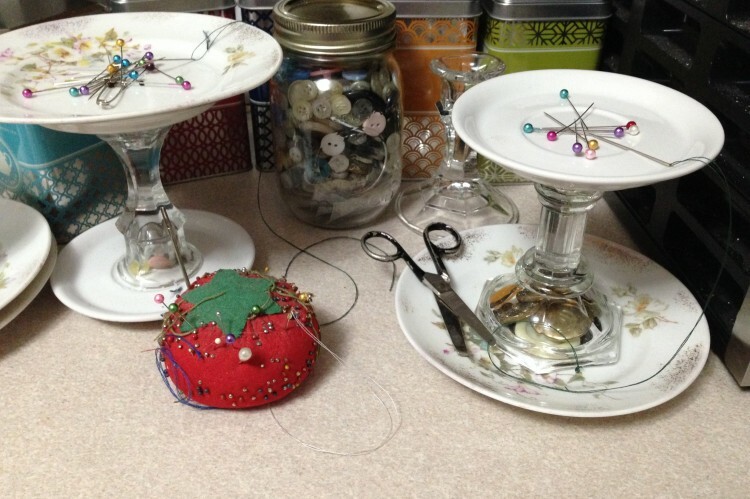 They are not difficult to make, but they do take a bit of time and planning. 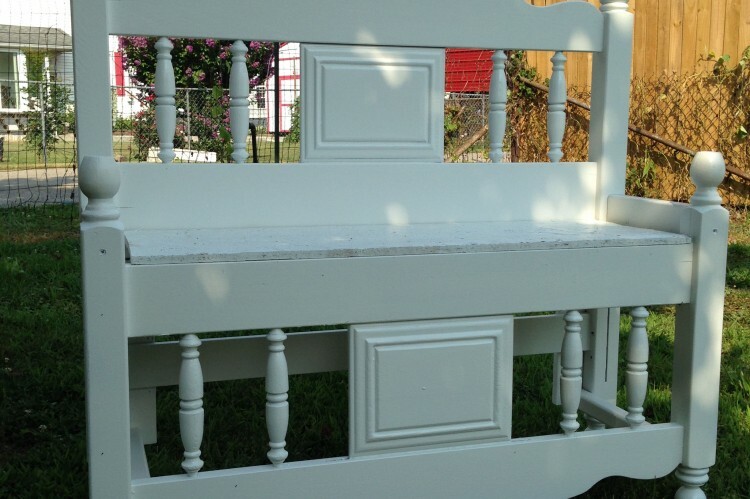 An old headboard or foot board is needed for the basic frame of the bench. You also need lumber to complete the frame and provide support for the seat. Wood screws are preferred over nails, but nails are fine. A piece of plywood for the seat, and paint will complete the project. Stripping the paint is optional for your bench, it a matter of preference. 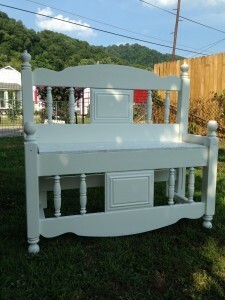 The headboard and footboard I used had many layers of paint. The topmost layer was a shade of blue somewhere between navy and periwinkle. Underneath was a dark brown covering the original dark stain popular in furniture back in the 1980’s. I opted to strip the wood as much as possible. This took a lot of time because of the spindles, and knobs. The finished white bench is a testament to the effort invested. The width of the headboard will set the width of the bench. You will need to decide the depth of the seat. I measured a porch swing seat for size. Then cut the plywood to fit. For this particular bench I turned the footboard upside down. This was due to the shape. With the footboard is in the normal position there is a hump that would hurt the legs. The only other way to address that problem is to cut off the bottoms of the posts. This creates another challenge of the seat being positioned above the footboard, destroying the look. With the footboard upside down, I only needed to remove a small portion of the top spindle and smooth the ball by sanding. A little filler in the new top spindle hides the fact it was previously the bottom. Screwing boards on the back of the footboard and front of the headboard provides the support for the plywood seat. Cut the lumber to the desired size and build the bench sides. Two boards on each side, one at the seat and one at the feet, create stability and additional support. Painting the bench is a matter of choice. My bench is exposed to the elements, on an uncovered porch, so I wanted a paint made for the outdoors. Adding a cushion gives a bit more flare and comfort. Head and footboards can be found at yard sales, flea markets, and used furniture stores. In true upcycle fashion mine came from the trash, discarded by someone moving out of a rental unit. 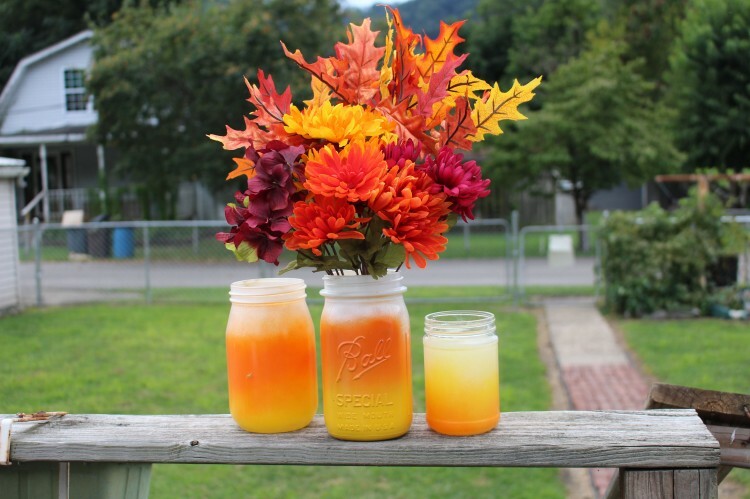 Don’t buy Mason Jars when plastic will do!